Out of 13,000 board-certified doctors, local physician S. Larry Schlesinger, MD, FACS is one of 100 in the nation named for the prestigious RealSelf 100 Award. Every year, RealSelf—the world’s largest community for cosmetic surgery, dermatology, dentistry and other elective treatments recognizes the RealSelf 100 as leaders in their ever growing community. One in four U.S. adults share their health experiences on social media channels. The medical professionals awarded the 2015 RealSelf 100 are recognized both for having an outstanding record of consumer feedback and for providing credible, valuable insights in response to consumer questions about elective cosmetic treatments. Each month, people from all over the world ask important and often sensitive questions related to aesthetic procedures such as breast augmentation, tummy tucks, and gynecomastia. To date, Dr. Schlesinger has posted 1,549 answers to questions on RealSelf and maintains a five out of five-star rating. 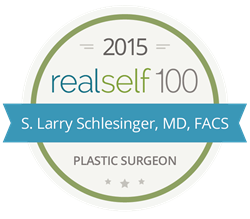 For more information on S. Larry Schlesinger, please visit The Breast Implant Center of Hawaii, and for the full list of RealSelf 100 Award winners, visit http://www.realself.com/RS100.